Collaborate on impact maps with stakeholders in real time, and see all changes on the fly no matter if it's a brainstorm session with a distributed team or a last-minute edit before a presentation. Map out clear directions that lead toward your business goals and plan future releases to see what impact they will have. Draw from an abstract idea to concrete features that are ready to be passed to the team in 4 easy steps. 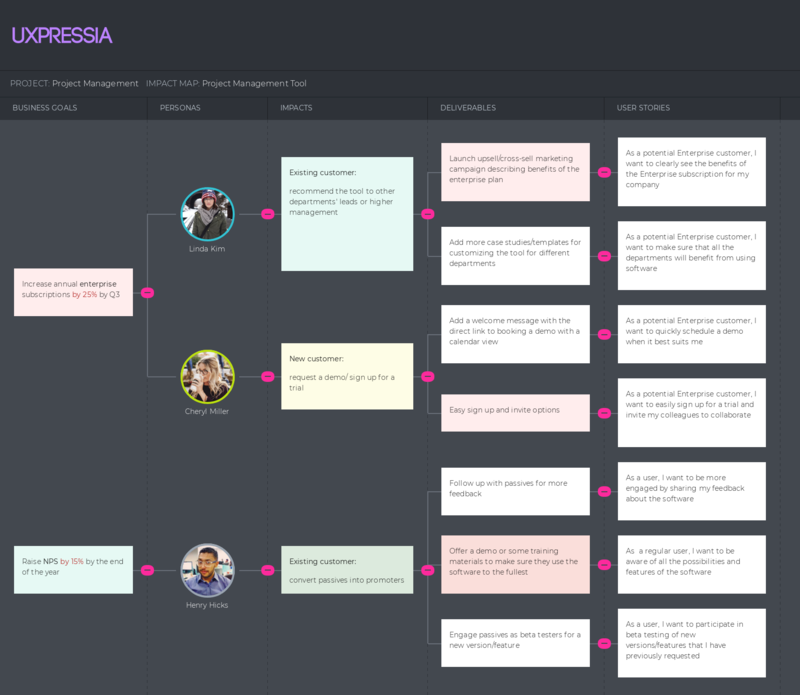 Save precious time by reusing your existing personas across your impact maps. Add depth to your personas using the persona tool. Take your impact maps offline by printing scalable PNGs or PDFs. Present your strategy to the team or do so to hang the map on your office wall and keep everyone on the same page. Add your company’s or client’s logo and color. Present your impact maps right from your browser online. It's just like good old slides — quickly switch between all of your CX assets with smooth navigation, full screen, and theme toggles — everything you need to make a perfect pitch.